ICEMA is the workshop of International Conference on Sustainable and Renewable Energy Engineering providing a yearly platform for delegates and members to present and discuss the latest research, and our delegates and members will have many opportunities engage in dialogues about Energy Materials and Applications. It also provides new insights and bring together scholars, scientists, engineers and students from universities and industry all over the world under one roof. ICEMA 2019 is organized by Hong Kong Chemical, Biological & Environmental Engineering Society and hosted by Department of Electrical Engineering of Tsinghua University, China. In the past 3 years, ICEMA has been held successfully in Seoul, South Korea, Hiroshima, Japan, and Zamora, Spain. 2019 4th International Conference on Energy Materials and Applications will be held in Beijing, China on May 11-13, 2019. ICEMA features invited keynotes as well as peer-reviewed paper presentations.The conference is completely open (one needs to register first), you will not have to be an author or a discussant to attend. Submissions will be peer reviewed and evaluated based on originality, relevance to conference, contributions, and presentation. 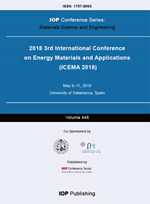 The accepted (Registered & Presented) full papers will be published in the IOP Conference Series: Materials Science and Engineering (Online ISSN: 1757-899X; Print ISSN: 1757-8981), which is indexed by Conference Proceedings Citation Index – Science (CPCI-S) (Thomson Reuters, Web of Science), Ei Compendex, Scopus, Inspec, etc. Full Paper is requested for publication purpose. With presentation only purpose, please just submit an abstract. ICEMA 2018 proceedings have been indexed by Ei Compendex & Scopus. Copyright © 2018. ICEMA All rights reserved.